t is I, Poffy The Cucumber! And I am here to save your planet from Rapture. And I have noticed that your malevolent christian god plans to quake the Earth and kill most of you who worship him and kill all the rest who don’t. (Does this guy need to get laid or what?) Sometime this coming Saturday. And behold, my wrath is ignited. And though it would please me to see the face of this planet wiped clean of the refuse of humanity, I feel it “too big a leap,” much like Newt Gingrich feels about Paul Ryan’s admittedly opprobrious budget plan to wipe out Medicare for sentient Americans. 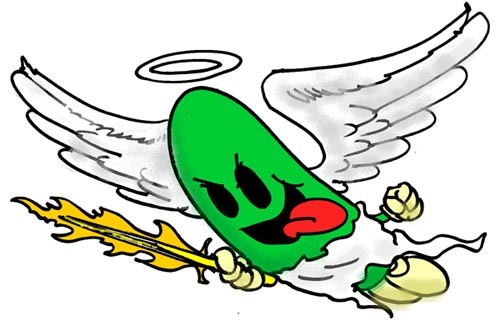 Therefore, o whining humans and puling pundits, I will stand against your christian god with the reptile heart, and use my badass magical cucumber powers to ensure your almost-unworthy survival. I will challenge the christian god to a duel of world-crushing strength, much like Gandalf challenged the Balrog on the Bridge of Khazad-dum. I will whack my staff on the living stone of this forbidden planet and tell your two-faced god, “YOU – SHALL – NOT – PASS!” and my staff will make a KRA-KHOOM sound and I will halt your petty, unloving, evil god in his comfortable sandals. Yes I will. The upshot of all this, my cowering humans, is that if Saturday passes without incident – and Sunday comes creeping like a nun – then you have ME to thank for it. No one else; not Batman, not Thor, not Neo. I am taking the credit right here. Keep the righteous praises to a dull roar, and don’t say too much about me being more powerful than god, or the god followers will surely kill you because they’re intent on spreading his peace and love. I do not ask for much in return for my unbounded beneficence in sparing your quivering lives of quiet desperation and futility, for I am a chaste and even-tempered god. All I ask is for you to sacrifice a fatted calf – and pay off all my credit cards. You don’t even have to send me millions of dollars like credulous, congenital idiots, but if you pray to me from time to time and leave offerings of 25-year-old blondes on my doorstep (female, height and weight proportionate, not virgins, augs a plus, no kids, non-smokers, enjoy greek), I will verily look down upon you and bless you and keep you from harm until 4 billion years from now when the sun will run out of hydrogen to fuse into helium and go red giant and cinder the inner circle of planets in our solar system. Then, you’re on your own. Cos the Sun is real, see. An earthquake will wipe out the planet, he sez, and “leave graves exposed and take people to heaven” and probably even make you fall and hurt your arm real bad. The worst part of Camping’s lunacy is that international media is giving this idiot unbounded credence and ubiquitous coverage. And he has amassed a fortune in donations – 72 million dollars – from other imbeciles who give christians a worse name than they already have as credulous, mouth-breathing saps. Which says all that needs to be said about the tenor of humanity’s intelligence at this supposedly advanced epoch of technology and civilization in 2011. — by Jon Dunmore © 20 May 2011.